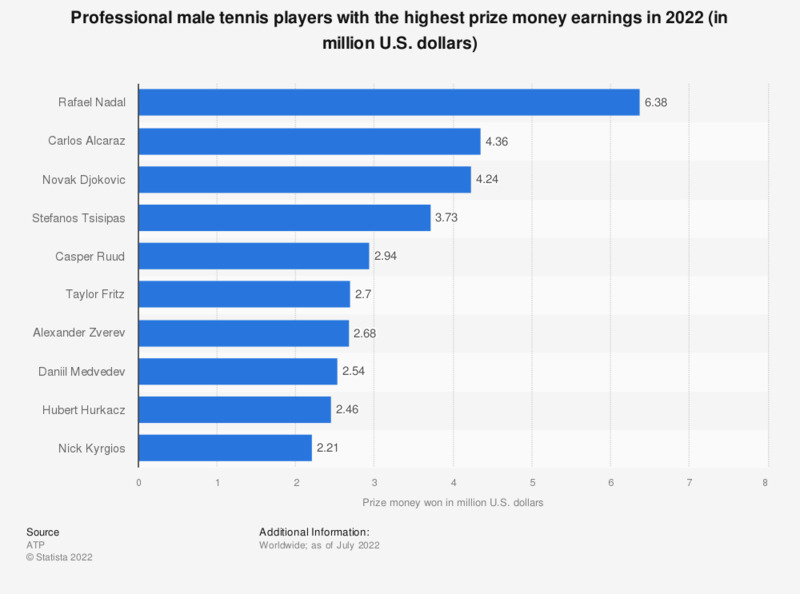 The statistic ranks the tennis players by the prize money won in 2019*. Rafael Nadal has won 1.48 million U.S. dollars in prize money in 2019 so far. He has also consistently ranked amongst the top tennis players in the ATP Rankings throughout his career. Since 2012, the Grand Slams have increased their total prize money considerably, with each prize pot now worth well over 30 million U.S. dollars. Wimbledon, the oldest of the tennis majors, currently holds the biggest prize pot, with 25 million pound sterling (about 43 million U.S. dollars) being distributed among the players in 2014. This included around three million U.S. dollars for the winner and 46 thousand U.S. dollars for each player who qualified for the first round. Rafael Nadal topped the prize money earnings in 2017 having secured six tournament titles, including the Grand Slam tournaments, Wimbledon and the U.S. Open. In addition to these major tournaments, he also won the Monte-Carlo Masters, the Barcelona Open, and the China Open.